Letter from Price Waterhouse & Co, to Mrs. L. Sauro, November 22, 1940. In cases where internees did not have any assets or debts of note, CEP often would remove themselves from the case. it would appear this was the situation for Libero Sauro, as indicated in this letter. Regardless, Sauro was charged a $15.00 administration fee (see ICEA2010.0008.0007). Recto: [t-b, l-r]: [printed on paper] PRICE, WATERHOUSE & CO. / ROYAL BANK BUILDING / TORONTO [typed] November 22 1940. / REGISTERED / Mrs. L. Sauro, / 104 Millwood Road, / Toronto, Ontario. / Dear Madam: / LIBERO SAURO / We have now been advised by the Custodian of Enemy Property / that he has no further interest in your husband’s affairs and we / should be obliged if you would be guided accordingly. 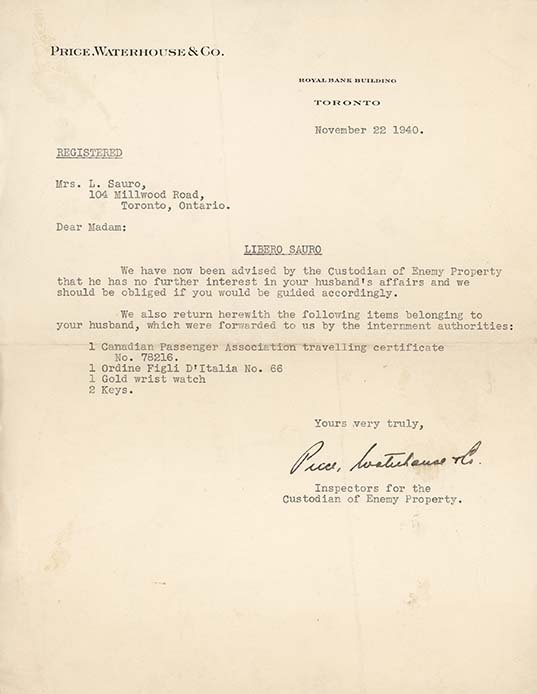 / We also return herewith the following items belonging to / your husband, which were forwarded to us by the internment authorities: / 1 Canadian Passenger Association travelling certificate / No. 78216. / 1 Ordine Figli D’Italia No. 66 / 1 Gold wrist watch / 2 Key. / Yours very truly, [signature in ink] Price, Waterhouse + Co. [typed] Inspector for the / Custodian of Enemy Property.